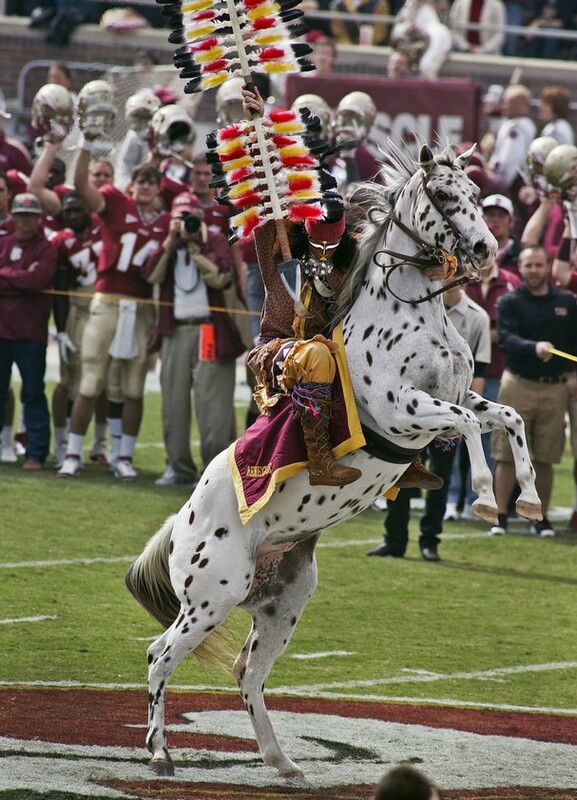 Week 11 rankings are in, Chief Osceola and the Seminole Nation of FSU have risen to #2 in the NCAA rankings which is up from their # 11 rank at the beginning of the season. They are definitely positioning themselves for a trip to Pasadena for this years BCS Championship Game, and may even bring a National Championship back to Tallahassee to go along with their 1993, and 1999 titles. (It will be the last BSC Championship game, the NCAA will move to a playoff system for the 2014-15 season). Oregon and Alabama were idol this past week, as FSU rolled #7 ranked Miami, which I might add is a damn good Hurricane team, and made them look like a Division III school. The Seminoles embarrassed the ‘Canes in Tallahassee 41-14. Florida State this season has put up 409 points, while only allowing 105. Granted ACC isn’t exactly the SEC strength wise, but FSU isn’t just squeaking by teams they’re “tomahawk chopping” them! If the Garnett and Gold can continue this pace, and go undefeated I personally see no reason why they shouldn’t be in the BCS Championship along with either Alabama or Oregon. As for the other four undefeated teams, Alabama (1), Oregon (3), Ohio State (4) and Baylor (6) none of them are slouches by any stretch of the imagination. Alabama is the reining champion, going for the “three peat,” and get the “legacy” vote since they’ve be in the Championship 3 out of the last four years. Oregon is probably the most electric team in Division I, putting up EAS PlayStation Scores game after game, behind their Heisman Trophy candidate quarterback Marcus Mariota. Ohio State, and Baylor, both impressive programs, but they don’t have the strength of schedule to legitimately jump over FSU if all three teams go undefeated down the stretch. As far as ‘Bama, and Oregon are concerned, one of them will be in the mix if not both, provided they stay undefeated, because the ‘Noles don’t have any “marquee” games left. That being said, a lot could shake down this weekend when The Tide, and the Ducks take to the field after their bye weeks. 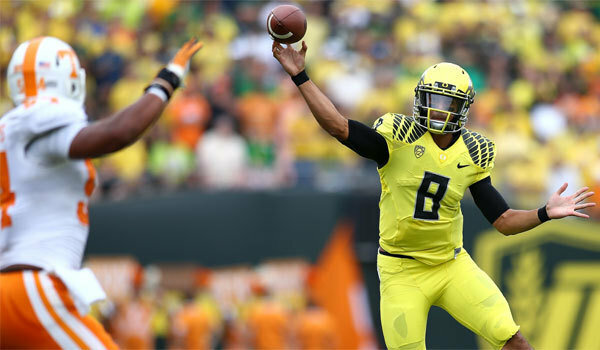 Oregon has Stanford (5) and the Crimson Tide hosts LSU (10). Not to mention Nick Saban, and his team get Auburn in the “Iron Bowl” in the regular season finale, while Oregon gets their in state rival The Beavers in their “Civil War” finale. I truly feel the real question of who should play in the Championship game if Alabama, Oregon and FSU go without a loss, should be Oregon, and FSU. That game would probably put up record scores, and be one of the most high flying FUN championships in a while. 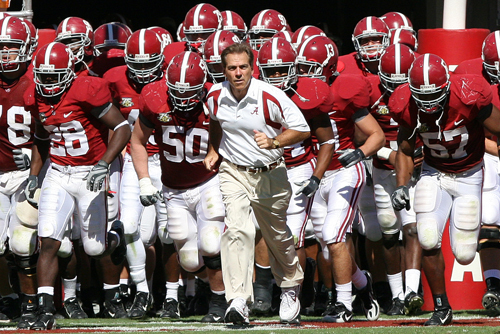 All in all, it should shape up to be a wild finish, so college football fans …Strap In!. This entry was posted in ACC, BCS, Big 10, college football, Football, SEC, sports and tagged ACC, Alabama, BCS Championship, Chief Osceola, Crimson Tide, Ducks, Florida State, FSU, Heisman Trophy, Marcus Mariota, Nick Saban, Oregon, SEC, Seminole Nation. Bookmark the permalink. Jeff, good insight. No matter what, it will come down to a subjective call if they all win out what a shame! It’s been an exciting season, for sure! It definitely makes me excited for the playoff system to kick in next year… Plus, who doesn’t want an excuse to watch a few more football games? A FSU vs OR sound good to me. Maybe the refs can help Bama’ lose a game??? Alabama vs FSU high scoring game on the field ,academic scores not so good !! !